On Thursday we posted about the Carnival Legend unexpectedly listing due to a technical problem with the ship’s starboard steering gear. Since we first posted about the unexpected listing last week more dramatic video footage has emerged online. Before we get to the videos below no passengers or crew were injured but many were surprised at the sudden listing. The Spirit class cruise ship was sailing towards its next port of call at Victoria, British Columbia. At around 6:00 PM on Monday, August 29 many guests were shocked when the ship began to list heavily towards one side. You can see how differently people reacted in the video below which was posted by YouTube user Nate Kosch. The sudden listing seemed to have lasted a few minutes and the crew reacted fast to make sure all was secure and nothing would cause any injuries. Some guests can be seen standing in shock while others head to the windows to see what was going on. In the next footage posted by Randy Gibbs water can be seen pouring from the open deck above all the way down the side of the ship. We do hope nobody was relaxing on any of the balconies below! There does seem to be a lot of water coming down but thankfully the balconies do have drains so the water will drain out. Just after the ship listing the Captain made an announcement on the public PA system. After the listing, the ship continued towards its next scheduled port of call and the cruise ended as normal back in Seattle, Washington on August 30. 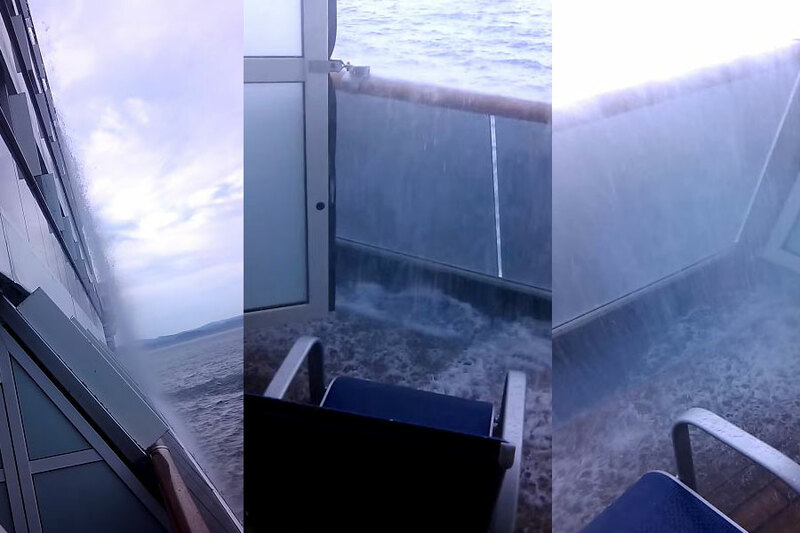 The reason we’re posting about this again is due to the unique reactions and the water coming down the side of the ship. We must state that cruise ship listings are more common than you might think and the weather can also play a major part.